I wasn't sure if I would start blogging again. I've had a lot of time for serious reflection during my blog hiatus. While the situation in my personal life has weighed heavily on me the last few months, I've also learned what's truly important to me. It's like the fog is finally burning off and revealing clear skies. The first weeks were pretty bad. I cried almost everyday. I truly hated my body for betraying me. This wasn't the "I hate the physical outward appearance of my body" but the "I hate the insides of my body for not working properly" and "why can't my body be normal?" After many weeks of worry and distress, I'm thankful that the last two weeks have consisted of more good days than bad ones. I never thought it would happen, and believe me there were days when I thought I wouldn’t be able to say this, but I'm beginning to feel like my old self again. Yet I feel like a completely changed person. I don't sweat the little things anymore. If you knew me you would know how difficult this is for me since I'm totally obsessive compulsive. It's been hard to change the person that I've been for so very long, but it also feels good to be free of my obsessive chains. I feel lighter and happier. I've always loved, respected, and appreciated my parents, but I truly learned to appreciate them on a whole new level. My mom cooked enough food for me and my husband so that I wouldn't have to cook dinner during the work week. She provided clarity on my situation and comfort whenever I was upset. My dad told me not to worry about our finances if I needed to take time off from my full time job. But I guess that's what parents do for their children. I will never, ever, take them for granted again. I feel surrounded by the safety and comfort they provide. My dear husband let me cry on his shoulder, handed me tissues to wipe my tears and blow my nose. He did the grocery shopping and picked up my prescriptions. He chauffeured me to doctor's appointments so I wouldn't have to try to find a parking spot (a pretty difficult task in the city). He accompanied me on walks around the neighborhood when I felt confined by the walls of our house. He sat on the sofa next to me for hours each night. I feel honored that we’ve chosen to be together for life. I’ve rediscovered a spirituality and faith that I thought was long gone. I know many people will turn to a higher power in times of crisis, but I didn’t do the “bargaining” as in “If you make me well I promise to X,Y,Z” since I thought that would be too cliché. I took my own path. Thank you to everyone who kept me in their prayers. I feel blessed. The kindness of strangers never ceases to amaze me. Thank you for the overwhelming support. Your comments and emails provided some much needed sunshine on my cloudiest of days. And it is this kindness that has made me decide to blog again. When I started this blog 2 ½ years ago my intention was to have a place to share recipes with friends and family. And because I didn't want to post the same recipe more than once, blogging would force me to try new recipes. I've become a better baker because of blogging. After some time, people I didn’t even know started reading my little blog. With that increase in readership I developed a sense of accountability. I was accountable not only to myself, but to you, the reader. I don't pretend to be a highly skilled baker. I'm just a baking enthusiast with a lot to learn. Luckily I have an endless source of willing taste testers. I don't pretend to be a writer. I'm not looking for a cookbook deal. (But I would like to congratulate those who have gotten a deal.) I don't pretend to be a photographer, but I figured that including some photographs would be nice even if my photos are so-so. If I had more time I would try to include more "work in progress" photos. I don't pretend to be a teacher, but I've been touched by the many emails and comments from people who have tried my recipes, learned from them and enjoyed the fruits of their labor. My favorite emails and comments are from people that have never really baked but were inspired by something they saw on alpineberry. So even though it was not my original intention, I hope that I continue to inspire people to get into the kitchen and bake. I hope that you continue to inspire me to become a better baker. 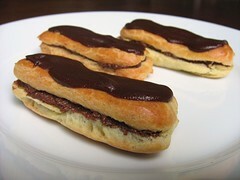 So I begin this new chapter by posting the chocolate éclairs I made for this month’s Daring Bakers’ challenge. The éclairs were super easy to make and were absolutely delicious. I made them a little smaller than the recipe stated because I wanted more servings. I was able to pipe 35 éclairs shells each measuring 3 inches long. 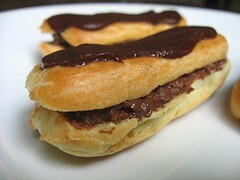 I filled the éclair shells with the chocolate pastry cream by using a small offset spatula. It was effective but definitely not as pretty as piping the filling with a decorative tip. But no one seemed to mind since the éclairs tasted so good. Thanks to hosts Meeta of What's For Lunch, Honey and Tony of Tony Tahhan for choosing éclairs. Click here to see the éclair recipe. 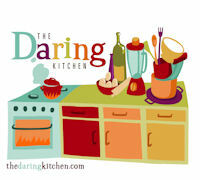 Please go to the Daring Bakers blogroll for links to other chocolate-y posts. The eclairs are a sweet note to return on, and I hope your life becomes sweeter, too. Oh Mary! I am so glad you are back my friend. I've missed you and I'm glad that you are feeling more like yourself. Your eclairs are wonderful looking. Welocme back. I hope everything gets clearer and continues to work its way out. I bet the eclairs tasted fantastic. So glad that you have chosen to return to the food blogging world. You were missed. So glad that you have the support system that you have, many others do not. So glad you are back and feeling like yourself a bit more! And what beautiful way to come back! Great job. Those Eclairs look really beautiful and perfect! Delicious too! No one is happier that your back than me. What a touching post. Welcome back. Mary i'm so happy you're feeling better. What better way to come back with the DB challenge?!! Mary, I am BEYOND elated that you've decided to come back to blogging, and that you're feeling better after the rough time you've had on your blog hiatus. It is so nice to have you back! It´s great to see you back, Mary. And I´m glad your medical problems are being sorted out so you see the proverbial light at the end of the tunnel. 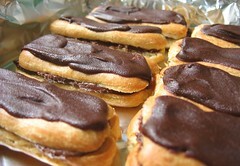 And the perfect way to return with those amazing eclairs, I´m sure they helped make life sweeter. I am glad the fog is lifting. I have been there. You have been missed!!!! Mary, glad to have you back!!! I missed you so much! Before I started my blog I was stricken down by something so scary and unknown I thought I'd never feel normal again. But the body does heal itself and I hope you are on your way to overcoming whatever has brought you down. Glad to see the fog is lifting :). Wonderful eclairs and what a way to come back! Welcome back! I've missed reading your blog these past few months. I'm glad you are feeling better and your eclairs look wonderful. Thanks for the comment on my blog. I'm new to DB, but reading through your post, I believe you represent the ideals of Daring Bakers. It's not just about baking. It's about a sense of community and sharing - knowledge and laugh, triumphs and stumbles. It's about inspiring even if that wasn't your original goal. I think it's very cool! So happy to have you back again Mary. We really don't appreciate our body properly until gets 'foggy'. So glad you're feeling more like the old you. Glad you're back and feeling better! What a great post. The eclairs look wonderful. Can't wait to see what you come up with now. Your post made me smile. And not just because your éclairs look good enough to make me wish I had more. Welcome back! I'm glad that things are getting better for you. Those lovely eclairs couldn't have hurt. They look beautiful! What a story you tell. Great to hear that you are 'better'. Love your honest comments. Love your eclairs. Thank God you're back! Your blog was the first I ever read and through it I learned about the Daring Bakers. I absolutely LOVE your recipes and I can't wait to see what other wonderful goodies you are cooking up. Your recipes are always so creative yet simple. I have used your recipes for parties and they have always been a big hit! I'm so sorry that you are going through some tough times. My family will keep you in our prayers. Your eclairs look great by the way. They look so professional. Welcome back and glad to see you've decided to continue blogging. Stay strong! I hope that life is looking more smooth and positive. Welcome back, everyone is very glad to have you here. oh, you're back! So happy to hear you feel better physically and you found a different outlook on life in parts. Wishing you and your family lots of strength to continue getting better. Looking forward to trying the eclairs and to more writing/recipes/photos from you. Those eclairs are beautiful. Thank you for the lovely comment over on my blog too. So lovely to see you again. And with such beautiful eclairs, too! Mary when you commented on my blog I was not sure if it really was you - but yes it was! i am ecstatic that you are back. 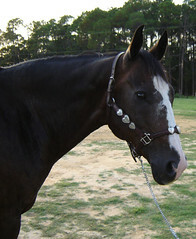 While I do not know what illness took you away from us - I am happy that you are back and the rest just does not matter. glad to have you back! oh yes and those eclairs look grand too! Just when I was starting to blog, I found alpineberry. I loved it right away. I was sad when I read your last blog and hoped that you would return. I kept checking since May and I was so excited to find you back this morning! Praise God. I hope that you will continue to do well. I think this will be good therapy for you. I am sure there are many happy people out there now that you have returned. I'm glad that you're feeling better and that you're back to blogging. I think that we all need time to reflect on blogging and the place that it has in our life. And you're right. We have gifts that come to us on a daily basis that help us through like family and friends. I am so glad to see you today Mary. And even more so to hear you are doing better, doing well, and the fog is lifting. Wow, good looking stuff you have there! I've had a rough time of it myself lately with the death of my sister, so I understand needing some breathing room. Welcome back though! This was my first visit to your blog and I came because of the Daring Bakers challenge. I don't know you, but my heart goes out to you for whatever it is you have been going through. Your eclairs look fabulous and what a great way to come back from your hiatus. Take care! I'm so glad to hear that you are feeling better and that your family has been so supportive. I hope your hiatus has been healing. I'm very glad to see you made the eclairs, they are beautiful indeed. Mary, So good to have you back! Serious illness can be a dark time for the soul...very glad the fog is lifting and you have found the silver lining of knowledge of your own strength, the love of family that does not go away, the support of friends, the sunshine that seems even brighter when the fog has burned off. Beautiful eclairs! Who needs fancy tips for the pastry cream? Yummy! Mary, your éclairs are beautiful! And I'm glad you are feeling better. So good to see you back Mary! Your eclairs look just wonderful and I'm so happy that you are feeling better. Keep running the good race my friend! it's fantastic to see you back, mary. my thoughts go to you. I am so grateful the fog is lifting!! Welcome back. You were missed indeed. Mary, it's so good to hear from you again! I'm glad you are feeling better, and it's wonderful to know you're back in the blogosphere! Wonderful to see you back. I kept checking your blog to see if you might change your mind, or if circumstances might change. So glad to see a new entry! I really love the way you bake, your photos and your narratives. Your blog really is exceptional. I wish you good health. Yum, your eclairs look good enough to eat for breakfast. Way to go on this month's challenge, your ecliars look soo wonderfully full of chocolately goodness. Hi Mary! I haven't blogged in nearly a year myself, but I still peek in on my favorite blogs. I'm so glad you returned to blogging and hope you are blessed with continuing betetr health and much happiness. :-) The eclairs look fantastic! I'm so excited you're back! I love your blog. I hope you continue to feel better. Thanks for commenting on my eclairs. I just read about your hiatus and your comeback and am glad you are feeling better. I can't wait to read your future posts! Your eclairs look really nice and puffy! Wonderful .I'm so happy you'r back! You are a ray of sunshine. It is so good to see you back again. Take care of yourself, you have a lot of good people in your corner. Welcome back, Mary! Yours is one of the best baking blogs on the Internet. Your eclairs look yummy. Long may you bake! You are back! HOOORAY! I hope the good days continue for you for a very long time. good to see you back, and glad to hear that the fog is lifting! Hey APB...welcome back babe! i completely understand where you were. I was there myself nearly a year ago. one day at a time babe...one day at a time. ain't nothing like a good support network. I'm so glad to see that you are back, and even making daring baker things. Your eclairs look wonderful, fat and everything. Glad you are back, and more importantly,that you are feeling better. Having been trough a serious illness myself, I know that when you are in the midst of it, it seems you will never be better. And then one day, you start to find yourself again. Make sure, though, that you give yourself the time so that you can continue to heal. Welcome back, Mary! I am so glad that you are feeling better. I wish you all the best for a full recovery. So glad you are back. I've been checking your blog to see if you would post. It's so good to see you here again, Mary. So, so good. We don't know each other personally but you are one of the magnificent people I have come across through blogging. People who are miles and miles away and I may never see in front of me, but with whom I feel connected because of the love for food. I'm glad to hear your family were there for you. That is really, really important. And be sure that these Brazilian fingers are crossed for you. I feel strange about leaving a comment, but wanted to say that I've been reading your blog for a VERY long time and was very sad to see you go, without even knowing why. I have to agree with Anonymous one post above. There are many people who you have touched with your blog that don't own a blog but just read them. Thank you for what you give to your online readers. You are inspirational! Glad to see you have a great team of supporters. Beautiful blog. I just discovered it today while looking for lemon bars. Ironically, I am on a medical leave and am using baking as a sress reliever. Hope you are feeling better. Rmb someone out there will be praying for you..good health always! I am so glad you have come back. I have enjoyed going back and trying some of your recipes and these eclairs look wonderful. Here is to the return of good health. Mary, I was a reader of your blog much before I started blogging. I was really sad when you "closed" it. I just landed here today by "accident" and to learn that you're back and in full force! THANK YOU for coming back! Finding this now made me very happy!